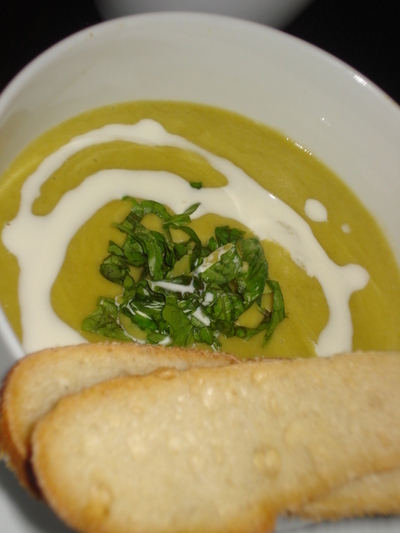 Whisk Wednesdays: Split Pea Soup - Spork or Foon? Your soup looks fabulous, I like the ham garnish. Hooray for entrees coming up! Love split pea soup on a cold wintry day! I feel the same way, like I am an adnevtourous eater, but know very little about the classics. 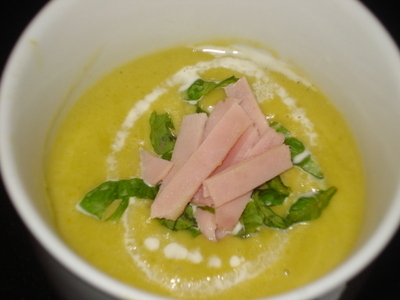 I am looking forward to makign these soups again in Fall! I love your cream as a garnish -- looks beautiful! I'm glad you liked it, and I'm looking forward to the entrees too! Oooh, my favorite sandwich, EVER. Grrrrilled tuna salad on light rye bread with cheese. They're known as "Tuna Melts" in the midwest, and it is the ONLY thing I order if I go out to lunch at some greasy-spoon kind of place and they have one on the menu. Yummers. Your soup looks wonderful with that dainty trail of cream. It really was a good soup, wasn't it? I'll definitely make that one again. Your soup looks wonderful - wasn't it good?!?! Oh wow...your presentation is just wonderful!!!!! And the soup looks fabulous! Yum, I'm wishing for winter now, so I can make your soup. Looks great! Your soup looks lovely! Such a pretty shade of green! I'm glad you enjoyed it...yes, one of the heartland classics. Pity we didn't do chowders, but like everyone else I'm ready to end the soups for now! Beautiful soup and one of my childhood favorites. Your boyfriend is right, the classic version is made with a hambone, I think. And homemade French Onion soup is worth trying on a cool fall evening.